Held to the strictest interpretation of the definition1 and to the means by which the function is accomplisheds there is only one primary force that actuates any automatic weapon: namely, the energy generated by Ihe explosion of (he powder charge contained in the chamber of the barrel. There have been, to date, only two known means that can be derived from (his source of power that have resulted in successful operation: (1) the rearward thrust of the recoiling maaa: and (2) pressure generated in the bore by the expanding gas of the progressive burning charge. The former is known as recoil actuation, while the latter is labeled gas operation. All known means used in making an automatic weapon complete a full cycle fall into this broad classification, whether the mechanics employed be reciprocating or rotary. The recoil-operated type of weapon can be further broken down into two distinct classificat ions: short and long recoil. Gas operation, however, seems to have no limit in its application. For instance, the residual pressure remaining in the bore a few milliseconds after the projectile has cleared has been, for lack of a better term, called blowback. while in reality il is but another form of gas operation. However, the most common method of employing the energy created by the gas of the exploding propellant is to tap the barrel and let the expanding gas be brought to bear on an actuating device such as a piston, lever, etc. The system is universally referred to as "gas operation", erroneously implying that this is the only way gas pressure is utilized as a source of power. If one were satisfied only with generalities, it would be quite in order to state that there are only live known practical applications for accomplishing sustained fire as outlined in the definition oían automatic gun: (1) short recoil; (2) long recoil; (3) gas pressure in the bore bled off externally through an orifice (gas operation); (4) residual pressure remaining in the bore a few milliseconds after the projectile has cleared (blowback); and (5) blast energy generated by the expanding gases after being released from the confines of the barrel at the muzzle end (muzzle blast actuation).2 These are considered the basic principles and from these, simple variants of power, more than 3,000 patents have been issued since 16 June 1884 on operational features of machine guns. So thoroughly have the gun designers of the past covered the subject that since World War Í the individual was indeed skilled in his profession if he could even make an improvement on a feature that had already been in existence a long time, much less originate something that could rise to the dignity where il could truthfully be called an invention. 1 Automatic Machine Gun—A weapon capable of sustained fin? : with its operating energy being derived wholly from the force generated by the explosion of the propellant charge. 2 Although relatively unimportant, two other systems should be mentioned to complete the picture. "Blow-forward" is a method in which the barrel is held to the rear by heavy spring pressure against a solid non-recoiling breech that supports the cartridge, gas pressure driving the projectile forward through the bore to move the barrel off the rmpty cartridge case. "The Gast system" is a double-barrel arrangement whereby the firing of one barrel furnishes the power to load, lock, and feed the other barrel, with unlocking being tied in with the. first part of xecoil movement. the rate of fire would be about 600 rounds a minute, while if delayed blowback were employed, the overall weight of the gun would Ix- slightly more (alnnit 100 pounds), but the weight of ihe bolt or recoiling parts could be held to a bare minimum (6 pounds), and the rate of fire rould be brought up to as much as 1,000 rounds a minute. 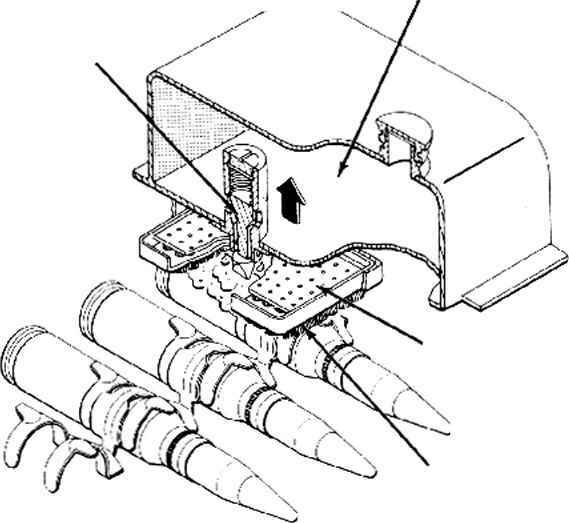 On the other hand, the maximum elastic ity of the conventional tvpr cartridge case, coupled with the inevitable high chamber pressures of today, makes the timing factor too critical to permit any consideration of retarded blowback in the design of a large caliber automatic weapon. Such comparisons arc limitless when based on the fundamental principles governing the design of automatic weapons. It is the purpose of Volume IVof "The Machine Gun" to analyze these principles in such a way that the designer has before him at all times the minimum and maximum potentialities uf any system of his choosing. Fach and every one has its strong and weak points. No two are alike, but all have one thing in common. For every obvious virtue there is a hidden feature thai is extremely critical and the designer who meets with any degree ot success will still have to depend not so much on some clever way to utilize an unlimited power source but on his thorough knowledge of all systems so that he can work his way out of traps of his own creation. The conventional 20 mm cartridge has been used arbitrarily in both the text and illustrations of this work as it represents the first step above rifle caliber and the starting bore diameter in automatic cannon design. Ir seems to be the most acceptable reference point for the designer regardless of the eventual caliber of his product. Likewise, emphasis has l>cen placed on the airborne automatic weapon Iweause its use under widely varied conditions requires a mechanism that must approach the ultimate of perfection. Having mastered its difficulties, the designer should find most of his other problems have been made relatively easy. Additional appendices contain an annotated bibliography listing source materials on machine guns and other automatic arms by topic and a similar subject listing of important patents of the 19th and 20th centuries, each with an abstract of its most outstanding features. If this work can help in any small way to revive in this country the almost forgotten art of automatic weapon design, a field so thoroughly dominated by Americans in the past, the effort and toil that have been spent in preparing the book will have been well repaid.